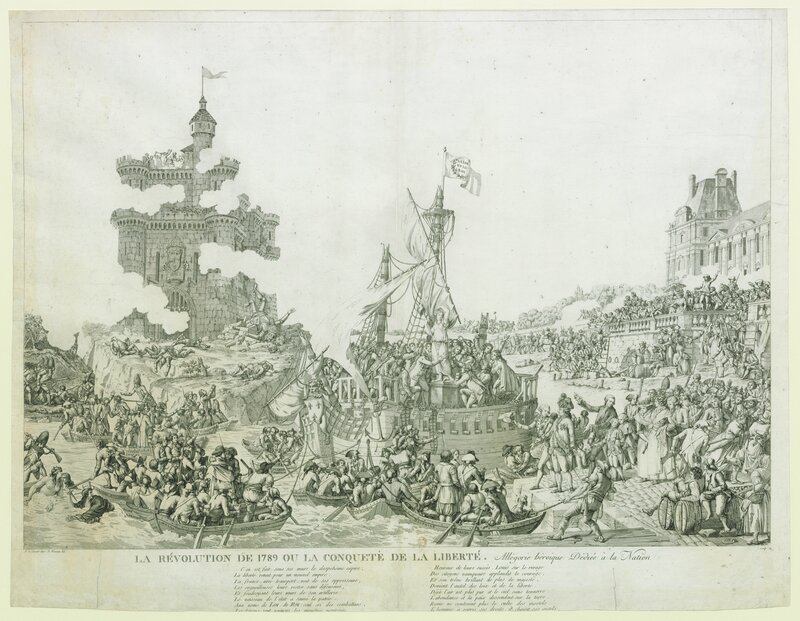 We have here a rich phantasmagorical image in which we see the revolutionaries crowd around a statue of Liberty with her Phrygian cap set on a rather weary “ship of state” surrounded by rowing boats named after different regions of France. Above each of the canons pointing out of the ship’s port holes are inscribed the principles of the new order: “declaration of rights”, “feudalism destroyed”, “privileges abolished”, “armed citizens”, “popular elections”, etc. 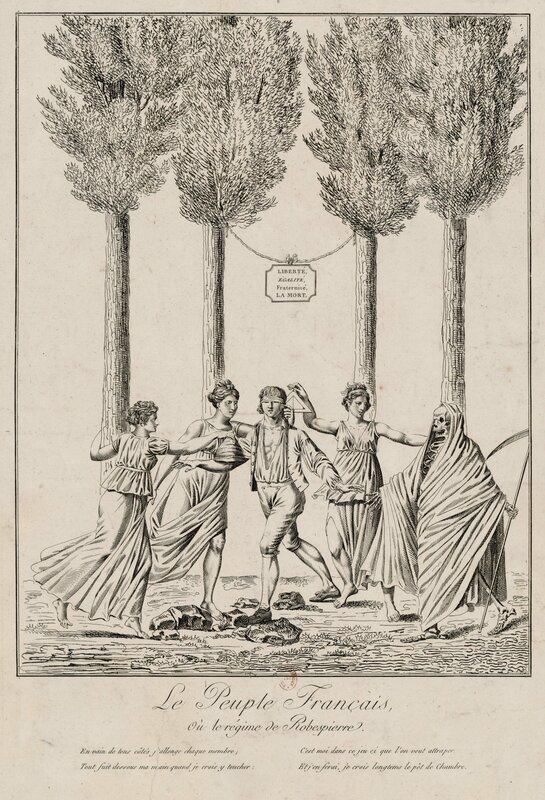 The early revolution took aim at aristocratic power and perceived abuses of power such as the lettres de cachet but not at the monarchy itself. So atop the ship’s highest mast flies a flag that proclaims “the Law and the King” and the monarch is here favourably depicted in the foreground. 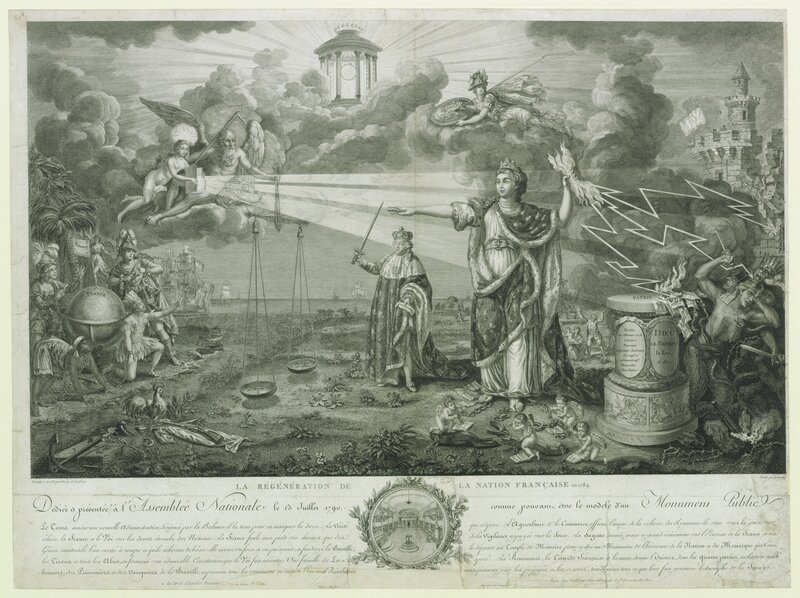 He is “happy with the success” of his people, the text below tells us, his “throne shining with more majesty” as it becomes “the altar of laws and liberty.” You have to look to the right of the image to see figures of oppression being ousted, carrying with them chains and the aforementioned lettres de cachet – their seemingly oriental appearance presumably a play on Enlightenment associations of the Orient with despotism. 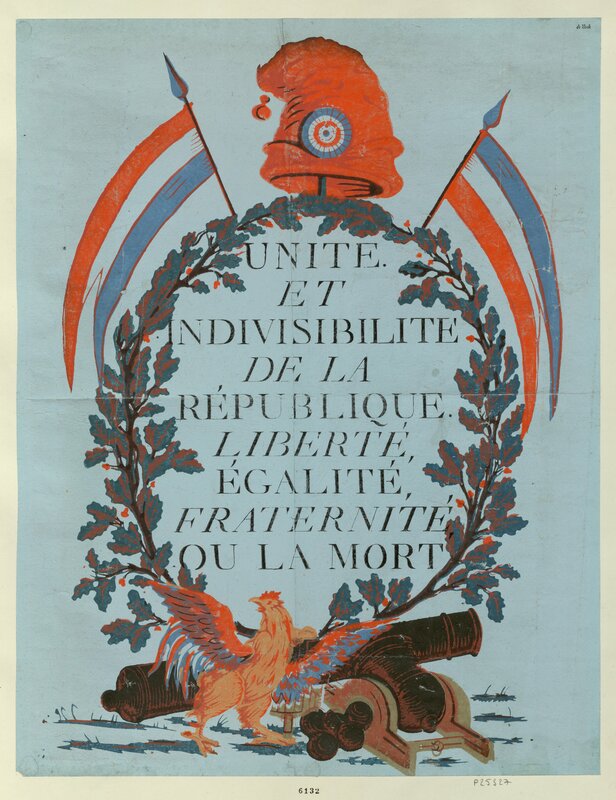 In the top left is a castle with its defeated residents – it doesn’t particularly resemble the Bastille so my guess is this is a stand-in for foreign powers (the coat of arms would probably identify them more accurately). 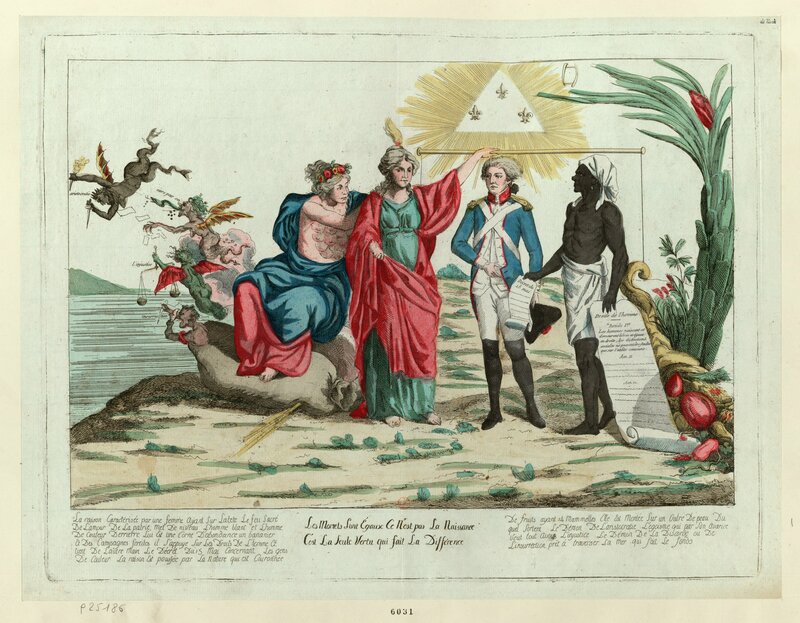 At the centre of is image is Reason (above her head is “the sacred flame of the love of country”) who puts on a same level the “white man” and “coloured man.” The latter holds in his hand the declaration of the rights of man as well as the decree of the 15th May 1791 that recognised the equality of rights to non-whites in the French colonies… as long as they were born of free parents. 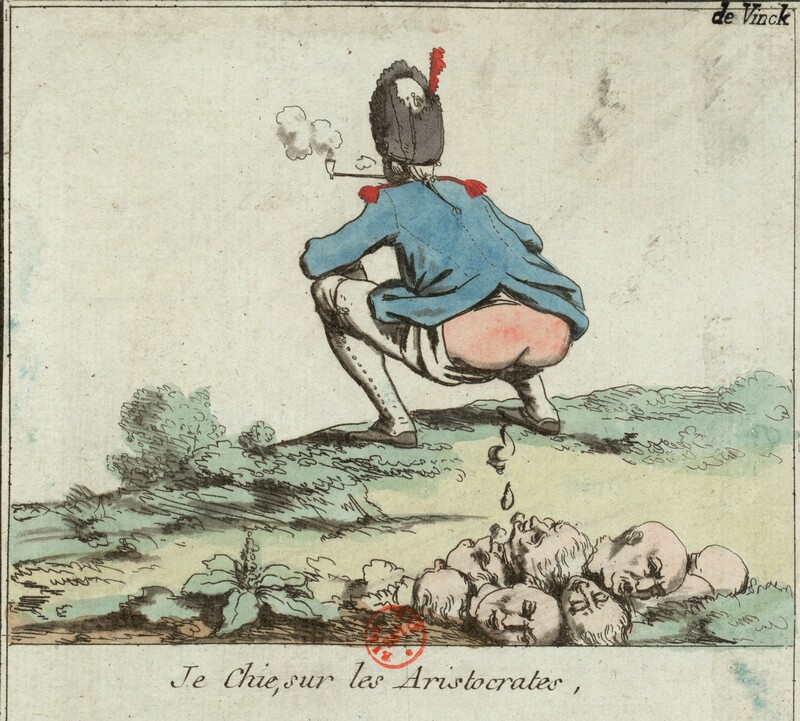 In this rather arresting output of the scatological imagination, the National Assembly sprays the crowned heads of Europe and Papacy with the scented juices of liberty. 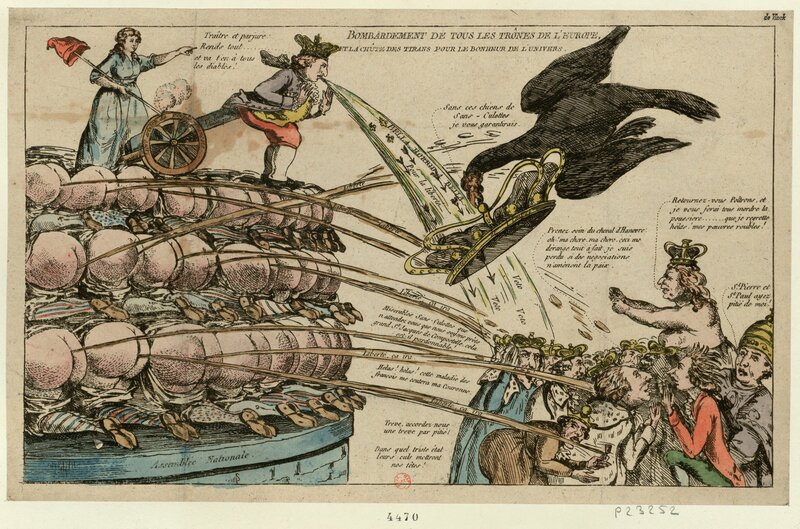 A “violent emetic” is fired into the French King’s rear from a cannon on which can be read “the free will of the French people”, the monarch spewing the Latin words bella horrida bella (“wars, horrible wars”). The Sans-Culotte behind him harangues him: “Traitor and perjurer. 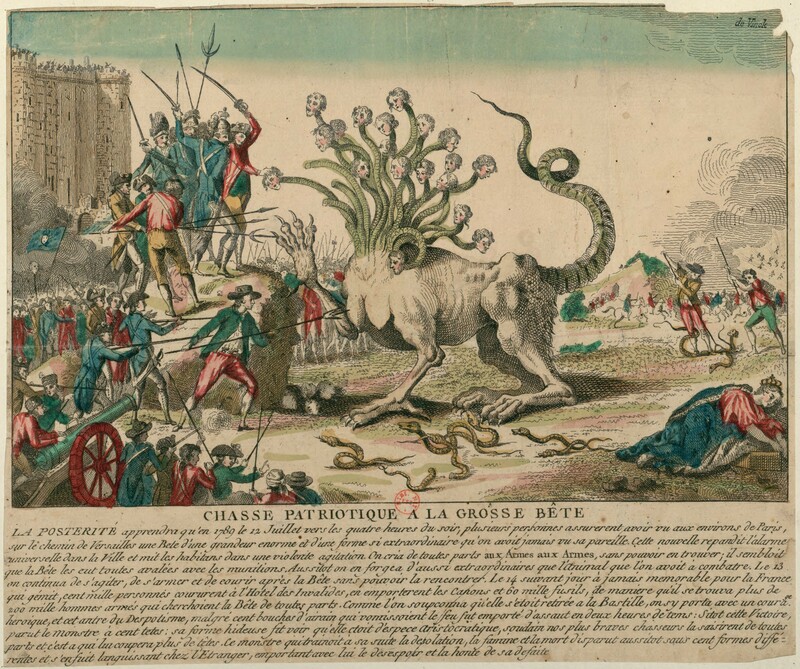 Give [vomit] it all back… and go to hell.” The mood is increasingly turning against the king. 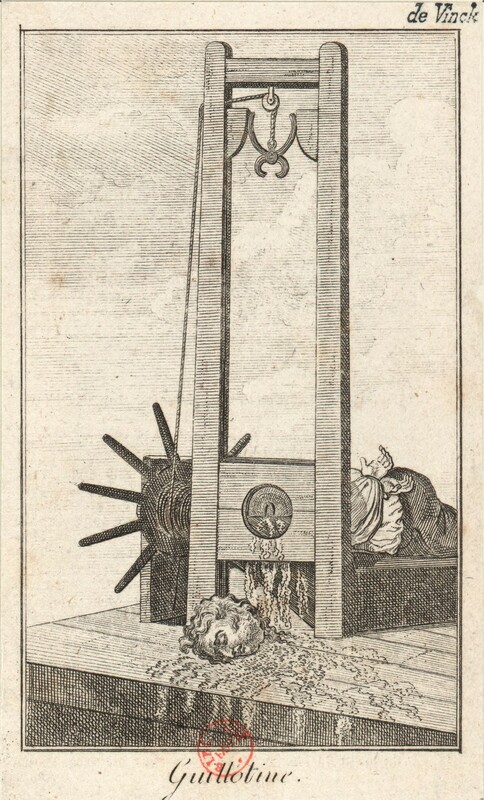 Ceci n’est pas une guillotine. The Terror is in full swing. 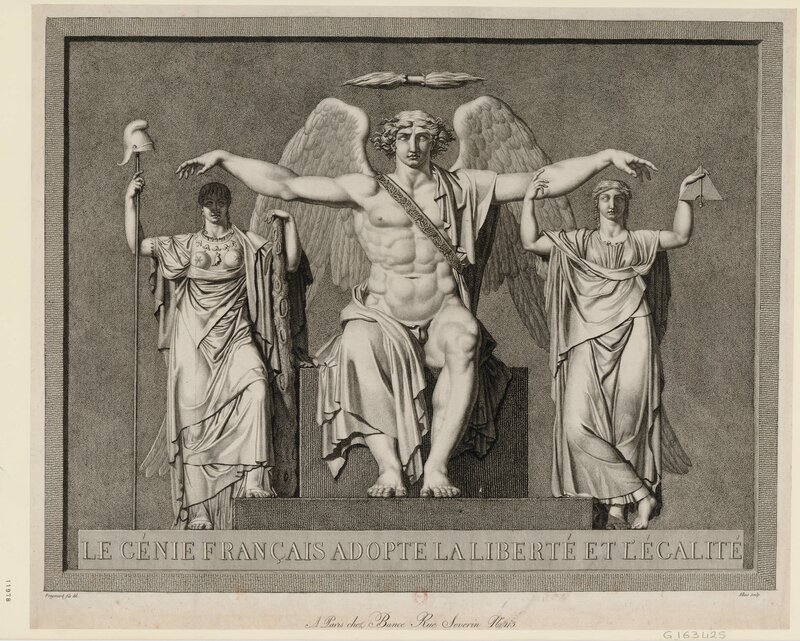 Robespierre is sitting on an obelisk on which is inscribed “Here Lies all of France” and is trampling the constitutions of 1791 and 1793. 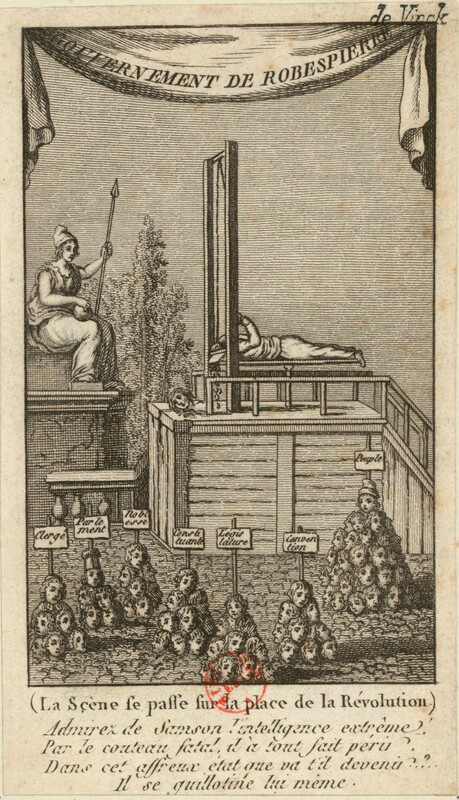 Behind him is a sea of guillotines, each associated with particular groups that fell prey to revolutionary justice, among which noblemen and priests, military men, Girondins, Jacobins, the National Convention, the Committee of Public Safety, “people of talent” and “old people, women and children.” Robespierre would of course himself meet the same end in July 1794. 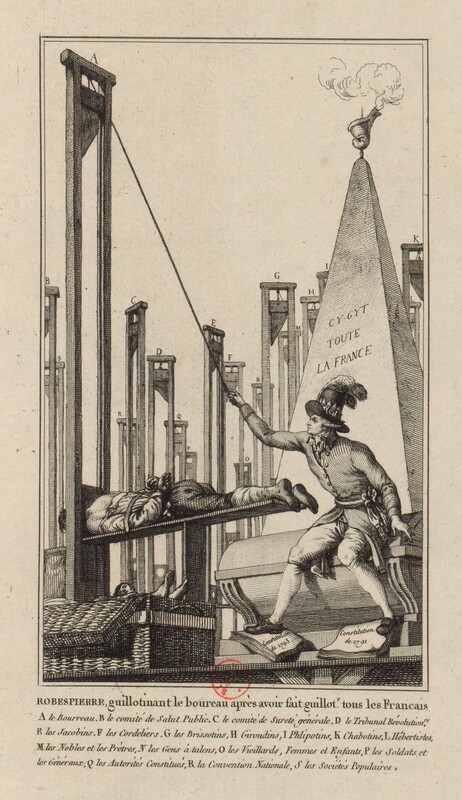 Issued from an illustrious family of executioners, Charles-Henri Sanson was responsible for releasing the guillotine on Louis XVI, Robespierre and Danton among the almost 3,000 individuals he executed during his long career. 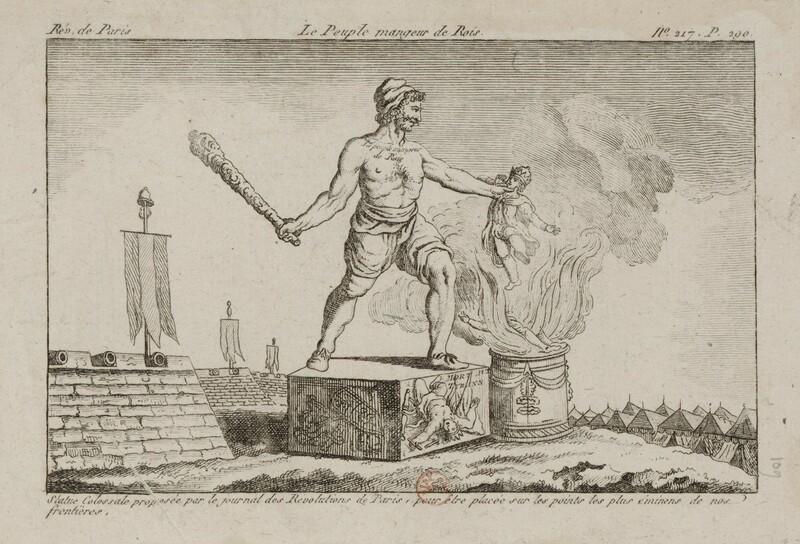 An image from across the Channel where revolutionary violence and regicide were received with widespread horror. 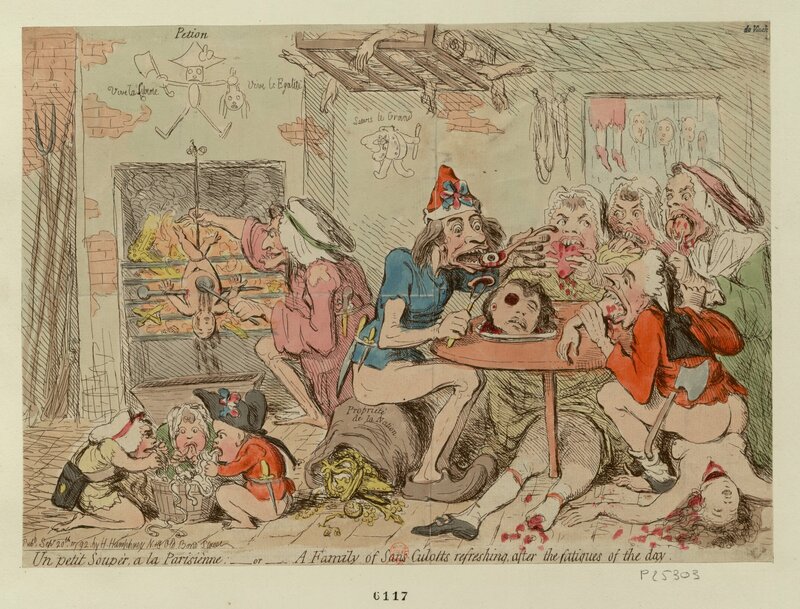 Caricatures of the time commonly depict the Sans-Culottes as a monstrous affront to civilised values with the English constitutional monarchy favourably compared to the perceived ungodliness of the revolution. 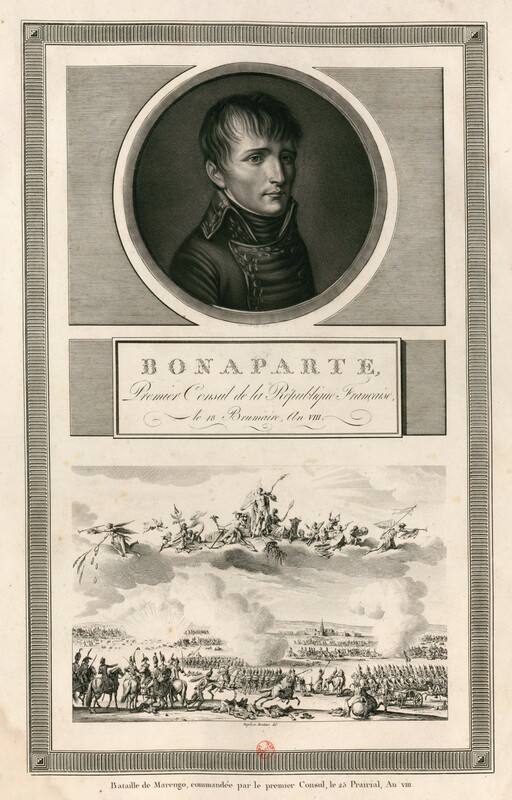 The years of war that ensued would eventually see the rise of Napoleon Bonaparte with the 18 Brumaire coup in 1799, heralding the end of the revolution and the Republic formally giving way to the Empire in 1804. 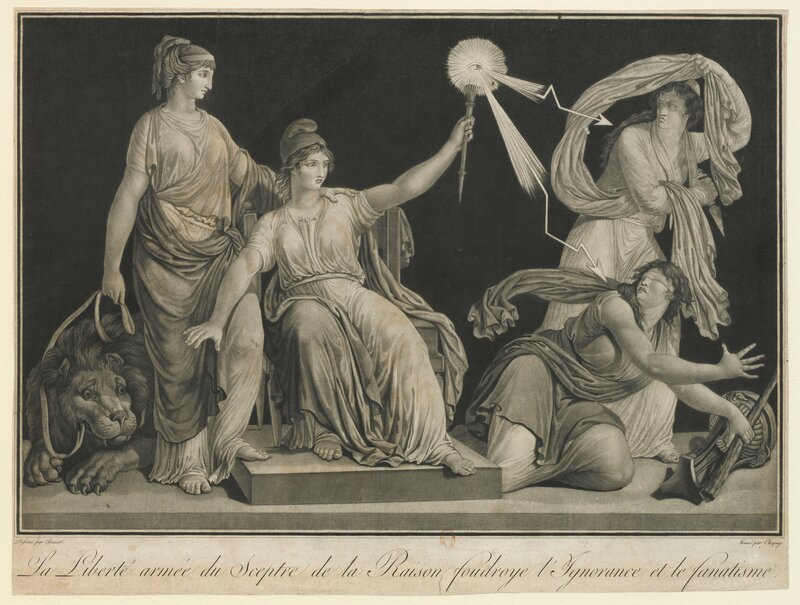 This engraving commemorates the Battle of Marengo of 1800 in which Bonaparte led the French army to victory against the Austrians, thereby strengthening his grip on power following the coup. Thanks for posting. 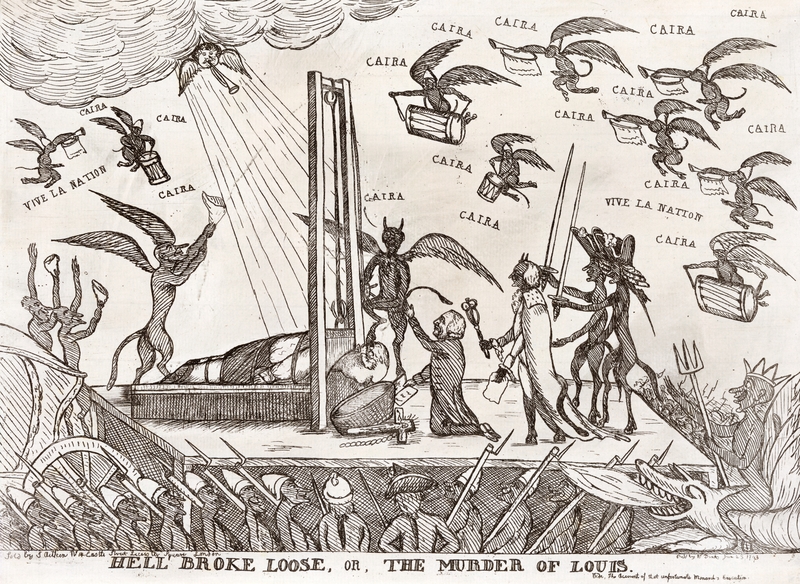 I have learned much, just from the imagery, about the French Revolution. 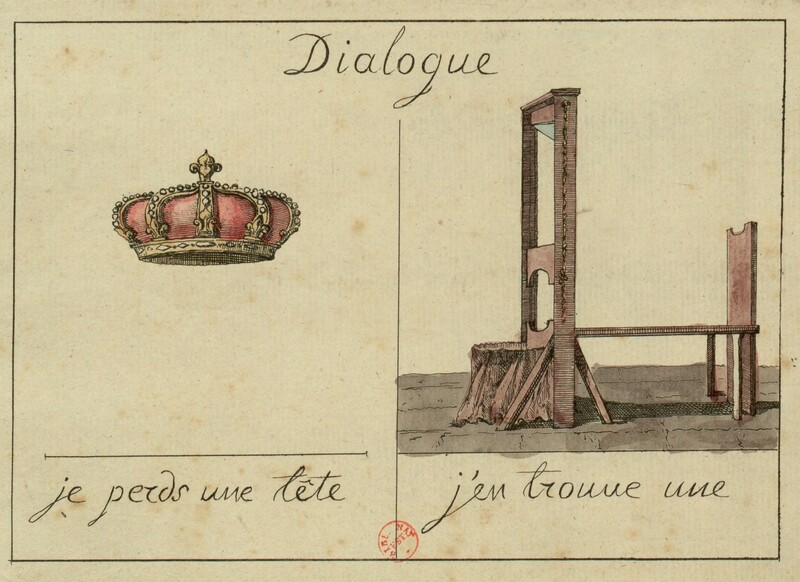 Reblogged this on AP EURO.